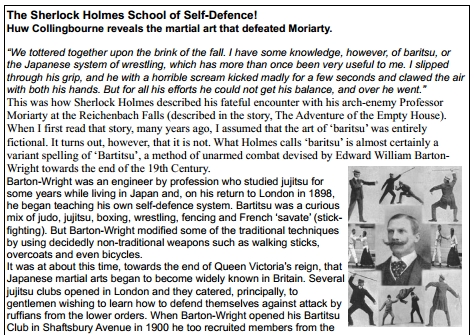 This month – The Sherlock Holmes School of Self-defence! If you happen to live in North Devon, you can grab a printed copy of the local Bideford magazine, The Bideford Buzz, at a variety of locations. If not, you can download a PDF copy here: http://bidefordbuzz.org.uk/print-copies/. In July I began writing a monthly column which has a fairly freewheeling ‘martial arts’ theme. Of course, since I am an Aikido teacher, you won’t be surprised to know that Aikido is likely to be one of my main topics of discussion. However, this month (August, 2012) I’ve branched out a bit by taking a look at Bartitsu? Contrary to what you may have thought, Bar(t)itsu was not an invention of Conan Doyle’s fertile imagination. It was a real fighting art which was taught to gentlemen in London. These days there are even some Bartitsu clubs and associations that attempt to revive the art (see, for example, http://www.bartitsu.org/). I can’t promise that we’ll be doing any authentic Bartitsu in our Aikido Club in Bucks Cross. Even so, I must admit that I am tempted to encourage students to dress somewhat more elegantly. Never mind those wrinkly white gis. Possibly a smart blazer, straw boater and silver-topped cane might add a touch of class to the proceedings…?